As I have often lectured in this space, much of what makes for an effective email has less to do with deliverability, mobile compatibility, social media functionality, and all the technical bells and whistles that most people fret about, and more about basic direct response principles such as a strong subject line and a compelling offer. As an example, see the email below from Novell (via Ziff Davis) inviting the reader to a free Webinar. At a basic level, Novell has a compelling message going for it, one that should resonate well in these tough times: Save 50 percent on enterprise Linux support costs. 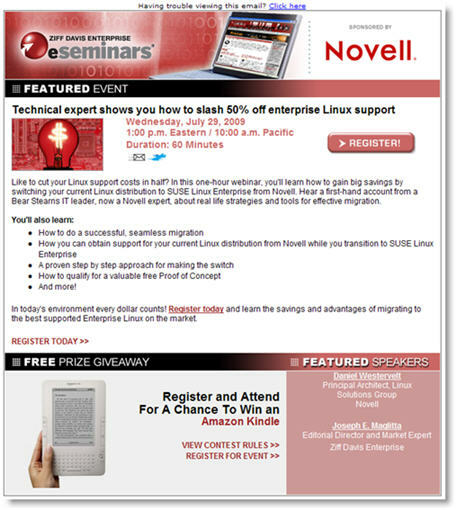 Unfortunately, however, that message is wasted in an email that reads as an invitation not to an informative event on how to cut IT costs, but rather a lecture on why you should buy your Linux from Novell. On a positive note, the headline “Technical Expert shows how to slash 50% off enterprise Linux support” highlights the key selling point, albeit in a confused way (I think it’s the cost of the support that’s being slashed, not the support itself.) Date, time, and call to action are all prominent and above the fold. All good; ignoring, for the time being, the gratuitous stock illustration that does nothing for the overall message. Then things go downhill fast. The Yes/No question is repeated once again, and then lo and behold I discover the Webinar’s true colors. This is not, after all, an opportunity for me to learn how to cut support costs. Instead, I’m going to spend an hour listening to someone describe why I should do business with Novell. You couldn’t invent a more heavy-handed approach. Novell missed a giant opportunity for explaining the merits of considering Linux alternatives, the pitfalls to avoid, how to choose a vendor, etc., all of which would have worked to entice IT professionals interested in saving costs wherever they can. Instead, most of the copy is one turn-off after another because registering for the Webinar seems to be pre-conditioned upon having already decided to do business with Novell. All in all, a great message lost in translation en route to a shabby execution. This entry was posted in B2B Marketing, Demand Generation, direct marketing, E-mail, lead generation and tagged b2b demand generation, b2b lead generation, B2B Marketing, email design, email marketing, Webinar best practices, webinar invitation, Webinar Invitations, Webinar tips, Webinars on July 21, 2009 by Howard Sewell. Howard I love it! I hope you are planning to write a book of these. I’ve never seen anyone give such pithy, specific and well reasoned critiques. I learn so much from reading them. Beats all those blogs that tell but don’t show.